It’s that time of year again. The SEO world is reflecting back on a year defined by unexplained shake ups in the search results. Rather than taking a look back on 2016, it’s much more fun to look ahead to 2017. Some writers were so excited for 2016 to end, they started their predictions as early as August. Other writers, like the brilliant David Mihm, have just recently published their predictions for 2017 (definitely worth the read). In this post, I want to look at a few different common SEO trends/predictions and offer my thoughts in a ESPN(ish) talkshow fashion called “Good news, bad news, no news.” Essentially, I’ll be sharing whether I think this SEO trend will benefit law firms, hurt them, or have no real impact. Google has been stressing the importance of mobile experience since back in March of 2015 when the digital marketing world had a simultaneous heart attack about the impending “Mobilegeddon.” Mobile search has continued it’s astronomical growth and with that, Google is capitalizing on a huge opportunity for additional revenue. 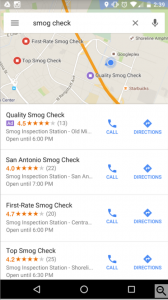 We’ve seen this trend already with new ad extensions (reviews and location data) and even more recently with the addition of local search ads on Google Maps like the example below. So why is this bad news for the average small law firm? I say bad news because it’s becoming a pay-to-play game, and fast. Legal has always been a hyper-competitive market – while you can still get solid results from beating your competition organically – you now have to compete with more advertising than ever before with less room on the search results pages than ever before. 2017 may be a good time to start thinking about the various mobile advertising options. Search queries are getting longer and more specific with the growth of voice search and shift in searcher behavior. Soon, tracking your ranking for broad terms like “bankruptcy lawyer” will become more difficult. This is great news. It’s very easy to use ranking as a measuring stick of success, but we shouldn’t, and soon won’t be able to. We’ve never used ranking as a measure of success at Mockingbird and never will. Our philosophy has always been to focus on the metrics that matter, which for law firms is new leads and ultimately new clients (not ranking for “car accidents”). This inevitable shift will free up business owners and their SEO agencies to focus on optimizing their website in a way that drives revenue, not rankings. Instead of focusing our efforts on rankings, we can focus on the user’s intent and how to solve their problems. Things are changing fast and it’s important to keep on top of the trends. In summary, think about investing in mobile advertising, forget about keyword ranking, and make sure your site is secure with HTTPS. Please comment with your own thoughts and predictions below! I really appreciate the insight here in this post and wanted to say thank you for your post. You are definitely not kidding when you say that 2016 was the year of SEO shakeups! The newest SEO trend in 2017 that I am most thankful for and looking forward to is the shift away from tracking keywords so that I can focus more on optimizing my clients’ websites in order to attract valuable traffic rather than focusing solely on rankings. Is there any SEO update for 2017 even I know about Google Fred update? Yes, tracking keywords is one of the most valuable thing for SEO as always. By the way, I am now only work on my pesonal project. Thank you so much. Many people don’t understand the relation between SEO and Google AdWords. In my opinion, it is better to invest in SEO – better and cheaper. Definitely the best place to start. You don’t want to sent people to a weak landing page. Thank you so much for this article. With Google changing so often and every year i’m always looking for up to date information. thank you so much for sharing! Very powerful information. This article has definitely change my way of thinking things now.